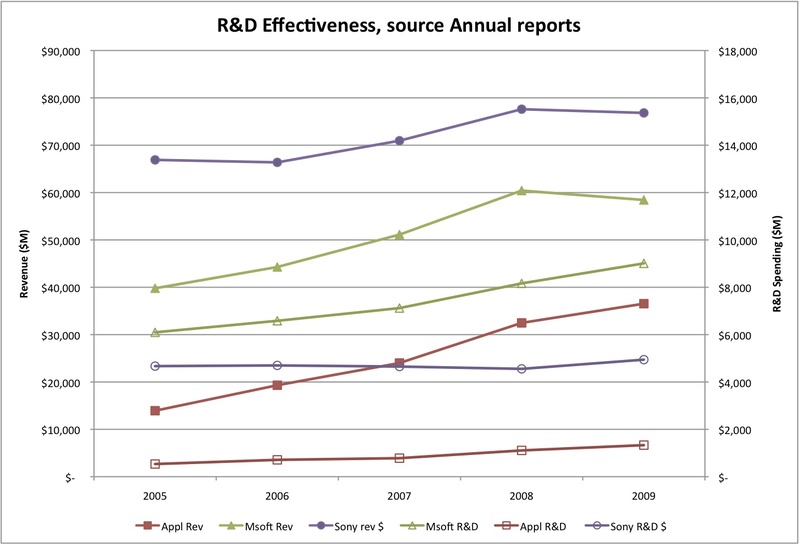 A recent Gizmodo blog post compared a decade of R&D at Sony, Microsoft and Apple. There were some interesting charts but mostly it showed that R&D as a percent of revenue, fluctuates from year to year and R&D spend has been rising for all the companies (although at different rates). Overall from a percentage of Revenue basis, Microsoft wins, spending ~15% of revenue on R&D over the past decade, Apple loses, spending only ~4% on R&D and Sony is right in the middle at spending ~7% on R&D. Yet viewing the impact on corporate revenue R&D spending had significantly different impacts on each company than what pure % R&D spending would indicate. How can one measure R&D effectiveness. Number of patents – this is often used as an indicator, but unclear how this correlates to business success. Patents can be licensed but only if they prove important to other companies. However, patent counts can be gauged early on during the R&D activities rather than much later when a product reaches the market. Number of projects – by projects we mean an idea from research taken into development. Such projectst may or may not make it out to market. At one level this can be a leading indicator of “research” effectiveness, as this means an idea was deemed at least of commercial interest. A problem with this is that not all projects get released to the market or become commercially viable. Number of products – by products, we mean something sold to customers. At least such a measure reflects that the total R&D effort was deemed worthy enough to take to market. How successful such a product is still to be determined. Revenue of products – product revenue seems easy enough but often can be hard to allocate properly. Looking at the iPhone, do we count just handset revenues or include application and cell service revenues. But assuming one can properly allocate revenue sources to R&D efforts, one can come up with a revenue from R&D spending. The main problem with revenue generated from R&D ratios are all the other non-R&D factors confound it, e.g., marketing, manufacturing, competition, etc. Profitability of products – product profitability is even messier than revenue when it comes to confoundability. But ultimately profitability of R&D efforts may be the best factor to use as any product that’s truly effective should generate the most profits. There are probably other R&D effectiveness factors that could be considered but these will suffice for now. Returning to the Gizmodo discussion, their post didn’t include any patent counts, project counts (only visibly internally), product counts, or profitability measures but they did show revenue for each company. From a purely Revenue impact one would have to say that Apple’s R&D was a clear winner with Microsoft a clear second. Although we would have to say that Apple started from considerable smaller revenue than Sony or Microsoft but Apple’s ~$148B of revenue in 2005 was only small in comparison to other giants. We all know the success of the iPhone and iPod but they also stumbled on the Apple TV. What then makes Apple do so good? We have talked before about an elusive quality we called visionary leadership. Certainly Bill Gates is as technically astute as Steve Jobs and there can be no denying that their respective marketing machines are evenly matched. But both Microsoft and Apple were certainly led by more technical individuals than Sony over the last decade. Both Microsoft and Apple have had significant revenue increases over the past ten years, that parallel one another while Sony, in comparison, has remained relatively flat. I would say both Microsoft and Apple results show that “visionary leadership” has a certain portion of technicality to it that can’t be denied. Moreover, I think that if one looked at Sony under Akio Morita, HP under Bill Hewlett and Dave Packard or many other large companies today, one could conclude that technical excellence is a significant component of visionary leadership. All these companies highest revenue growth came under leadership which had significant technical knowledge. There’s more to visionary leadership then technicality alone but it seems at least foundational. I still owe a post on just what constitute’s visionary leadership, but I seem to be surrounding it rather than attacking it directly.